For a full list of products shown in this video, see its YouTube description. The Micro Maestro is available fully assembled with 0.1? male header pins installed as shown in the product picture or as a partial kit, which ship with these header pins included but unsoldered, allowing the use of different gender connectors or wires to be soldered directly to the pads for lighter, more compact installations. The Mini Maestro 12, 18, and 24 are also available fully assembled or as partial kits. A USB A to mini-B cable (not included) is required to connect this device to a computer. The Micro and Mini Maestros have 0.086? diameter mounting holes that work with #2 and M2 screws. User’s guide for the Pololu Micro Maestro 6-channel USB Servo Controller and the Pololu Mini Maestro 12-, 18-, and 24-Channel USB Servo Controllers. 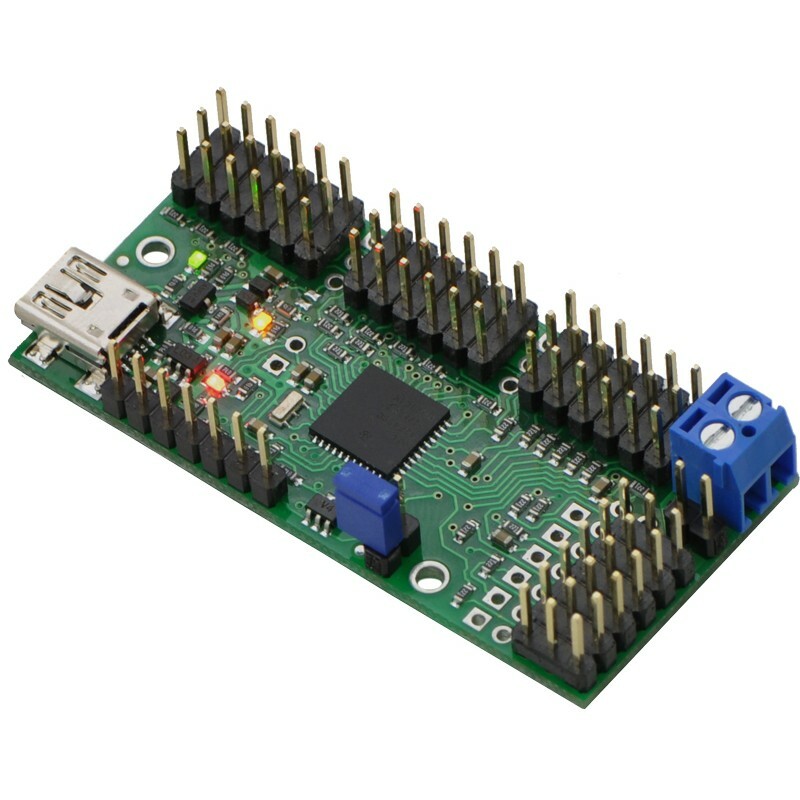 The Pololu USB SDK contains example code for making your own applications that use native USB to control the Jrk Motor Controller, Maestro Servo Controller, Simple Motor Controller, or USB AVR Programmer. A Spanish version of the user’s guide for the Pololu Micro Maestro 6-channel USB Servo Controller and the Pololu Mini Maestro 12-, 18-, and 24-Channel USB Servo Controllers, provided by customer Jaume B. In this short video, Pololu engineer Emily shows how easy it is to get started with Maestro servo controllers. Getting started with the maestro servo controller. This library allows you to control Maestro Servo Controllers from an Arduino. Polstro is a cross-platform C++ library for controlling a Maestro over its serial interface. Jacques Bitoniau created this library for his quadcopter control system, which is described in this blog post. The Pololu Maestro RoboRealm module provides a way to interface the visual processing of RoboRealm into servo movements using the Pololu Maestro USB Servo Controller. Released February, 2010. Patrick Hickey and Bradley Lord use a Pololu Micro Maestro for servo output and a Pololu 4 servo multiplexer to support manual control override in their model aircraft autopilot project. Published February, 2010. A simple obstacle-avoiding robot based on the Maestro, using continuous-rotation servos and distance sensors. The robot is programmed using the Maestro’s internal scripting language, without the need for an additional microcontroller. By TomatoWire, June 2010. Demo code to do web-based real time control of the Pololu Micro Maestro 6 channel servo controller using the Raspberry Pi and the Tornado web server. By MartinSant, November 2012.